Whether your spring means taking down turkeys or spring-cleaning out your hunting closet to make room for the newest gear, you’ll want to enter the Spring Gear Giveaway on Instagram. Seven top hunting gear brands have teamed up on the platform for an exciting giveaway that allows two lucky winners to walk away with more than $1,300 worth of top-quality products that’ll set them up nicely for spring and beyond. 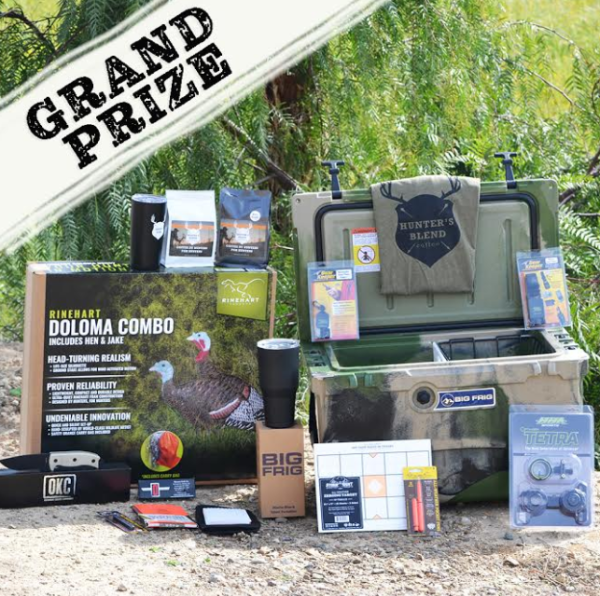 From Rinehart Doloma Turkey Decoys and an HHA Tetra bowsight to a 45-Quart Big Frig Cooler and Hunter’s Blend coffee — there’s nothing short of top-quality products included any hunter would dig to take home. Entering the giveaway is quick and easy. Simply make sure you’re following each participating brand’s Instagram page, and ‘like’ the contest photo on each page. Participating brands include: Rinehart Targets® (@rinehart_targets), Big Frig Coolers (@bigfrigcoolers), HHA Sports™ (@hhasports), Gear Keeper® (@gearkeeperproducts), Ontario Knife Company® (@ontarioknifecompany), Hunter’s Blend™ Coffee (@huntersblend) and Rite in the Rain® (@riteintherain). For more information about the giveaway, visit each brand on Instagram and see contest post. For more information on any product offerings, visit each brand online: Rinehart Targets, HHA Sports, Big Frig Coolers, Rite in the Rain, Hunter’s Blend Coffee, Ontario Knife Company andGear Keeper.